Two protesters with large signs interrupted Progressive Conservative Leader Brian Pallister’s speech at a rally on Monday at the Clarion Hotel in Winnipeg. 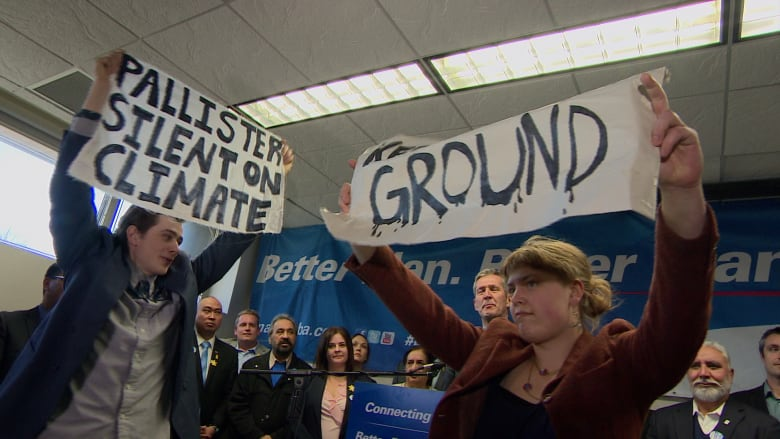 Two climate change protesters with large signs interrupted Progressive Conservative Leader Brian Pallister's speech at a rally on Monday at the Clarion Hotel in Winnipeg. Protestors Riley McMurray and Natalie Dyck spoke in association with the Manitoba Energy Justice Coalition (MEJC), a group that seeks to eliminate fossil fuel use and protect watersheds in Manitoba. "I don't agree with Energy East, I don't agree with the oil extraction that's happening in this country," Dyck said. McMurray and Dyck said they targeted the PC rally because the party has not yet filled out a voluntary survey sent by MEJC. The yes-or-no questionnaire attempts to find out where parties stand on reducing Manitoba's carbon emissions and the controversial Energy East Pipeline project ahead of the April 19 election. Manitoba Energy Justice Coalition protesters Riley McMurray and Natalie Dyck interrupted a Progressive Conservative rally in Winnipeg on Monday. (CBC)"It has 22 questions on where parties stand on climate change. Even the Manitoba Party filled it out. The Progressive Conservatives despite numerous attempts to contact them—about seven or eight—have not given a comment," said McMurray. "We're pushed to do this type of thing because the [Progressive] Conservatives were ignoring us." During the rally McMurray called on Pallister to lay out the PC's climate change commitments. Pallister responded by outlining his plan to remove conservation from Manitoba Hydro's mandate and create an arm's length agency to encourage energy conservation. "It's not right to have the agency that sells you hydro try to tell you they want you to use less," said Pallister. After the rally, Progressive Conservative Leader Brian Pallister said the protesters had a right to be there and express their views. "I've been a protestor so I understand," Pallister said. The PC leader added environmental stewardship is an important issue to discuss and he respects the protestors' passion for the issue. "The gentleman was raising issues of concern to me, quite frankly," Pallister. "I tend to agree with some of his concerns." In an email, Manitoba Progressive Conservative spokesperson Howard May said the Progressive Conservatives have confidence in Canada's regulators when it comes to the Energy East Pipeline issue. "Our role as legislators is to participate in the process and when it concludes ensure what next steps are warranted," May said. "Climate change is the greatest environmental challenge facing our planet. We will work in true spirit of partnership with federal, provincial and industry stakeholders," he added. When asked whether the Progressive Conservatives plan on completing the MEJC survey, May said he will have an answer on Tuesday.